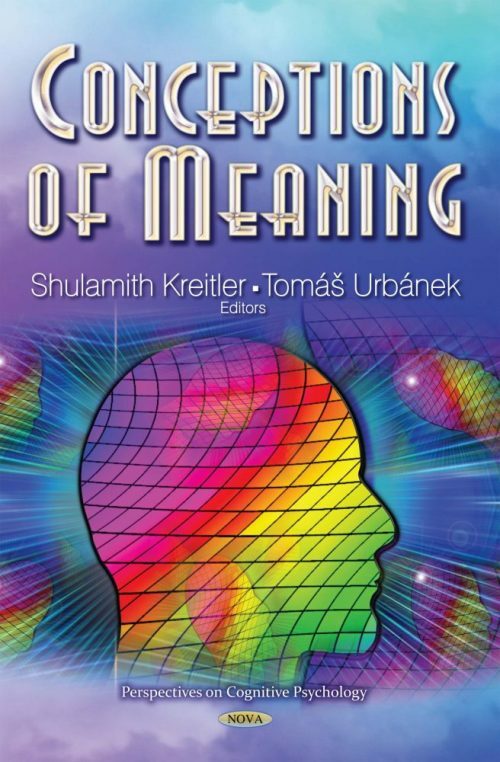 The book “Conceptions of Meaning” was edited by Shulamith Kreitler and Tomáš Urbánek, two psychologists who are known for their contributions to the study of meaning in psychology. The purpose of the book is to introduce Meaning back into psychology. Indeed, it has always been there, but it has not been developed and applied sufficiently to become prominent in the mainstream of science. The editors believe that the potentials of Meaning are too great and too important to be overlooked. The book includes 12 chapters by prominent researchers and thinkers who present different aspects and manifestations of meaning. In this book, the reader will find new conceptions of meaning, new methodologies, a variety of methods for its assessment, and innovative applications in familiar and new domains. There are four parts in this book. The first part is devoted to general conceptual and methodological approaches to meaning. Chapter 1 by S. Kreitler presents the meaning system, which is an innovative and comprehensive theoretical and methodological approach, with a broad empirical basis, tools for the assessment of meaning, and in regard to cognition, personality, emotions and consciousness. Chapter 2 by Petrenko and Mitina presents psychosemantics, which is a comprehensive theoretical and methodological approach to meaning, supported by a large body of data. It presents a highly interesting material of studies done by Russian scientists and that at least partly has not been commonly available until recently. The second part deals with meaning from the perspective of different disciplines. Chapter 3 by Riboli is a fascinating approach to meaning through the venue of sensory experiences in different cultures. Chapter 4 by Kantzara binds meaning to the concepts of self, society, social interactions, status, prestige and democracy from the perspective of sociology. Chapter 5 by Born and Gatarik approaches meaning from the point of view of philosophy and information management, keeping the discussion both abstract and practically concrete. Chapter 6 by Sages provides a theoretical and experiential encounter with meaning in the framework of phenomenology. The third part of the book is devoted to applications of meaning in various domains. Chapter 7 by Margaliot presents the theory, method and practice of the application of the system of meaning to education. Chapter 8 by Schnell presents a highly impressive project of constructing a viable, useful and updated instrument for the assessment of the most important and intriguing concept of meaning in life. Chapter 9 by Filip describes the application of Kelly’s personal construct approach to psychotherapy. The fourth part of the book is devoted to methodological approaches, capitalizing on assessment and empirical tools. Chapter 10 by Kuzari deals with semantic calculus, describing how the meaning of a sentence or phrase is constructed out of the meanings of the constituent words. Chapter 11 by Chrz and Cermak presents a comprehensive and lucid description of narrative meaning. Chapter 12 by Urbanek and Czekoova is devoted to the varied methodologies of textual analysis of meaning.